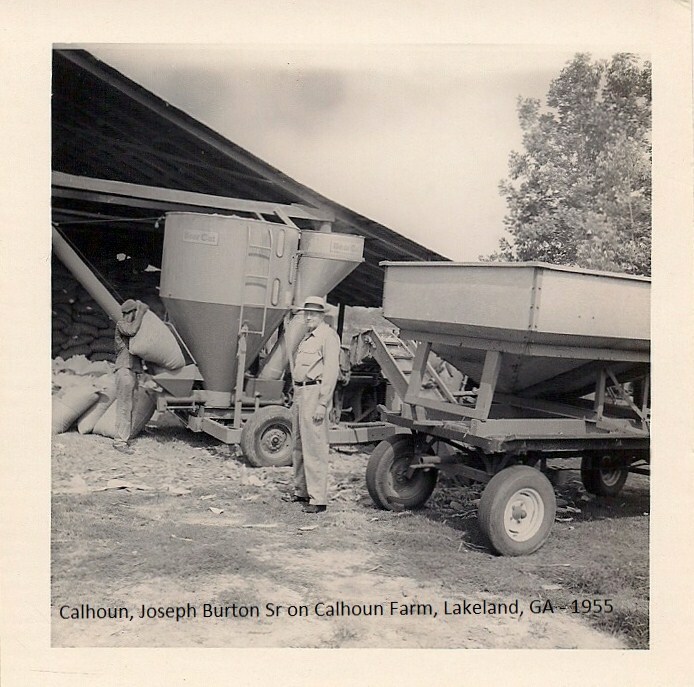 The Calhoun Farm, near Ray City, GA, 1955. The Calhoun Farm, situated southeast of Ray City on the shore of Banks Lake, originally made up a part of the Boyett family land. 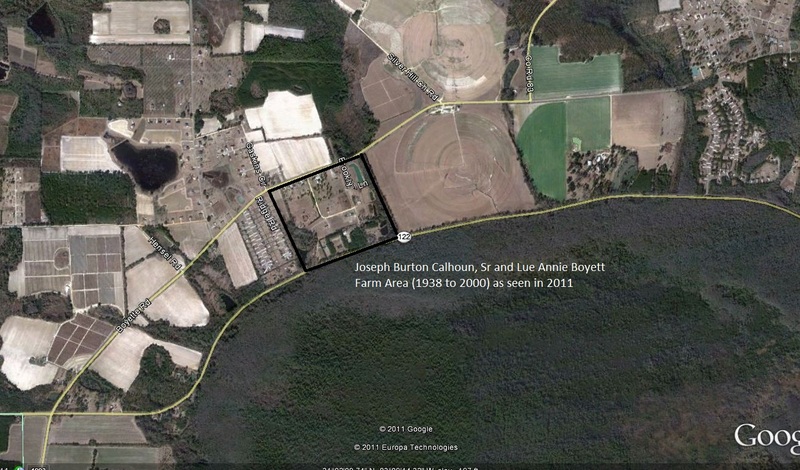 His daughter, Lue Annie Boyett Calhoun, inherited just over 100 acres of the family farm and a little cash. Joseph Burton Calhoun was a civic minded farmer, a member of the Lakeland Masonic Lodge, and the Parent-Teacher Association. In the 1940s, the school lunchroom in Lakeland was supported by donations, and vegetables contributed from the Calhoun farm were among the lunchroom fare. 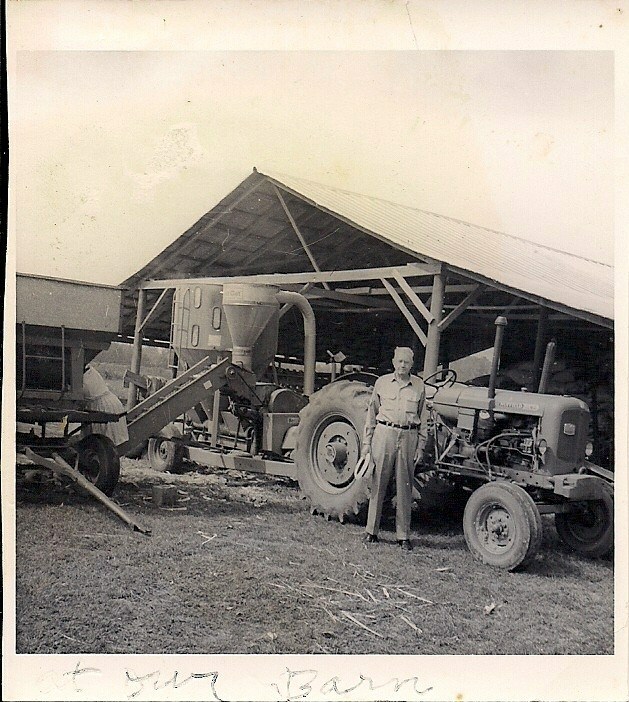 I. Mitchell Calhoun, grandson of Joseph Burton Calhoun recalls his grandfather at work in the barnyard out back of the farmhouse. Special thanks to Mitchell Calhoun for the contribution of images and content for this post, and to Wilburn Thomas (Tom) Boyette for additional input. 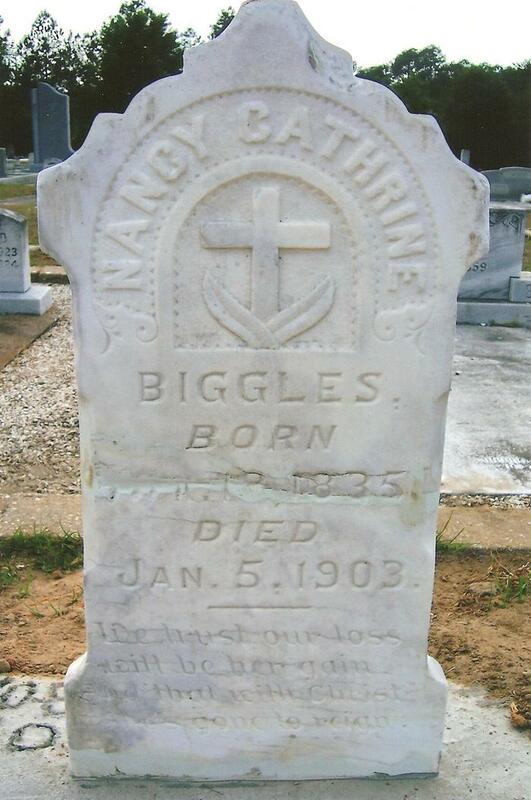 Lue Annie Boyette, born May 27, 1899 was the only daughter of Mary Jane Sirmans and John Boyett, subject of previous posts. Her father was a large landowner with a farm near Ray City in Berrien County. 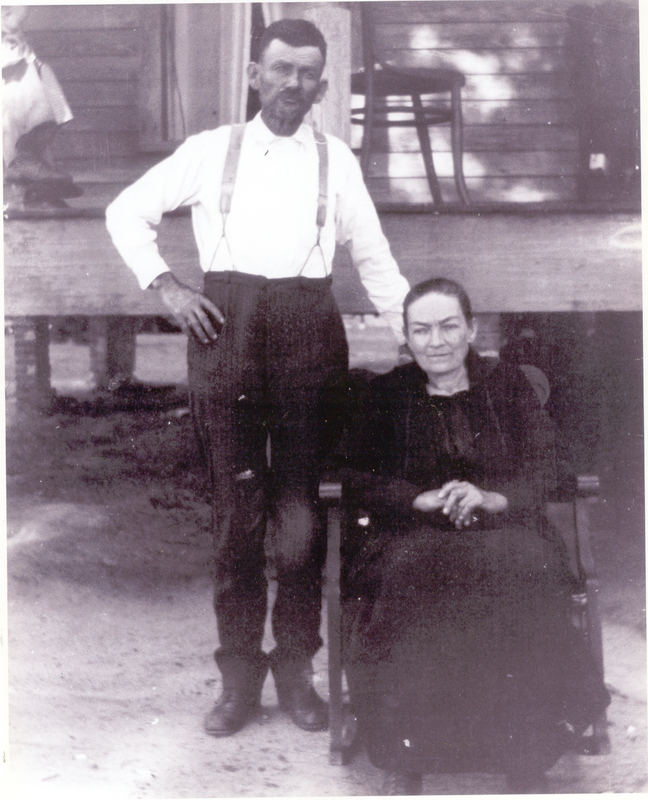 Lue Annie Boyett & Joseph Burton Calhoun of Ray City, GA, 1919. Image courtesy of I. Mitchell Calhoun. 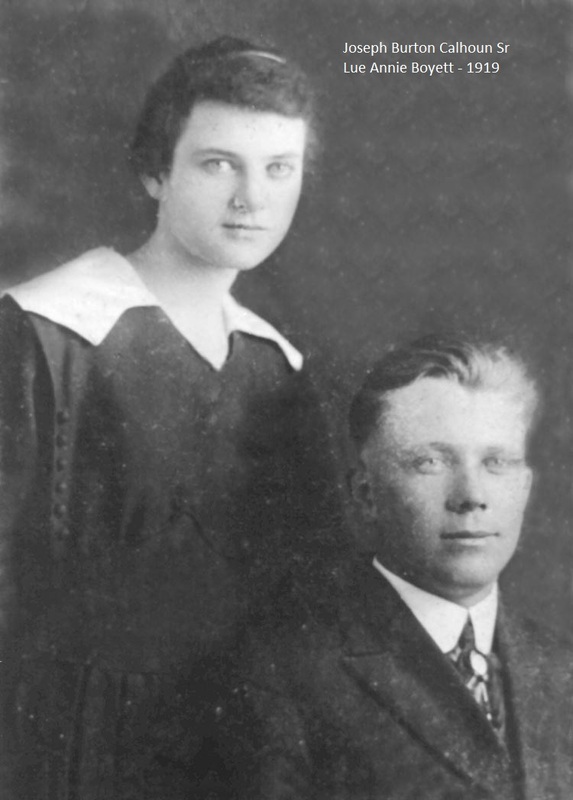 Lue Annie married Joseph Burton Calhoun on March 4, 1918 in Berrien County, GA. She was a bride of 19; he was a 26 year-old groom, of medium height and build, blue eyed and blond haired. Joseph Burton Calhoun, in army uniform, 1819. Image courtesy of I. Mitchell Calhoun. Joseph Burton Calhoun was a son of Samuel Augustus “Gus” Calhoun and Rachel B. Bullard, born and raised in Rays Mill, GA (nka Ray City). 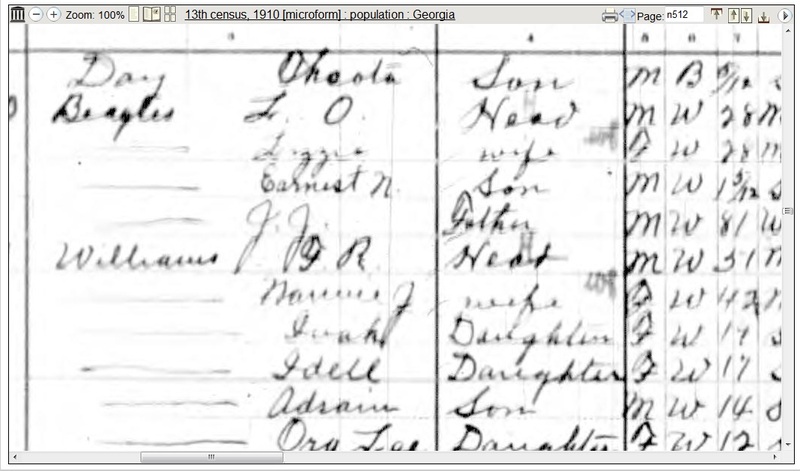 Prior to marriage he had been living in Moultrie, GA where in 1917, he was employed by J.M. Bryan as a mechanic. Lue Annie and Joseph first made their home in Ray City, where they were enumerated in the 1920 census. Joseph continued his trade as an auto mechanic, now working on his own account. 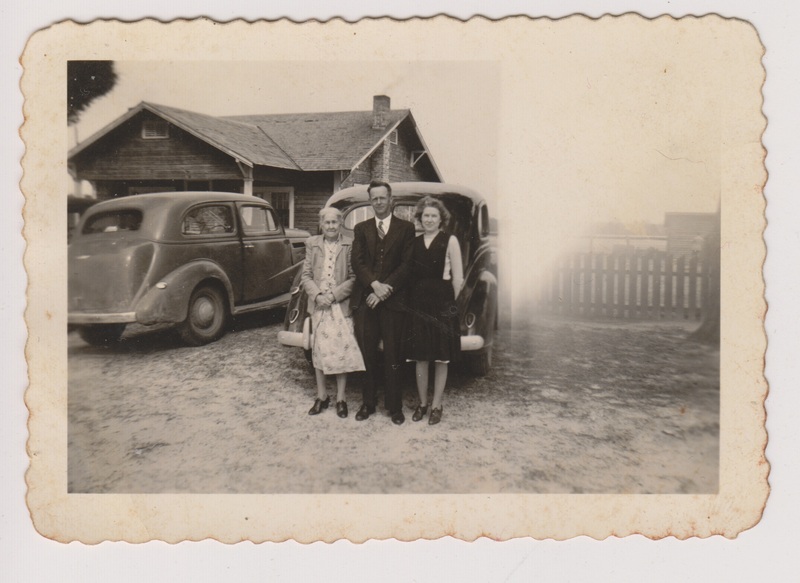 They had a house right on Main Street, where Lue Annie cared for their children, Alberta and Joseph B., Jr.
By the Census of 1930, Joseph and Lue Annie Calhoun had moved to Orlando, FL. There, Joseph Burton Calhoun continued his profession as an automobile mechanic. Lue Annie kept house and raised their three children. In 1935, the Calhoun’s owned a home at 4074 35th Ave N. in St. Petersburg, FL. Joseph worked as a service station attendant. 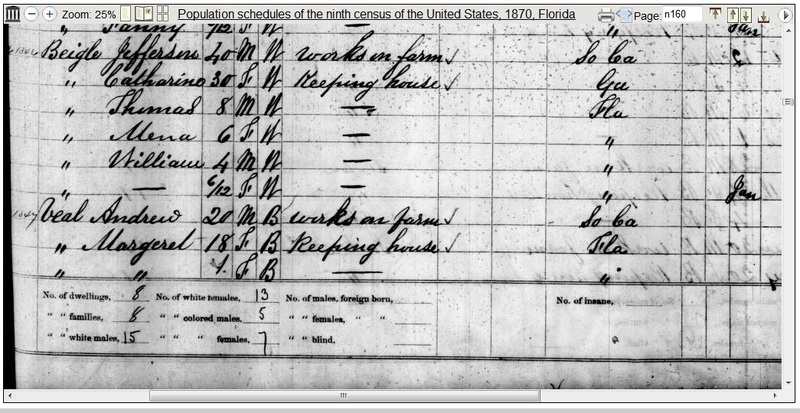 Enumeration of Joseph B. and Lue Annie Boyette Calhoun, 1935 Florida State Census, St. Petersburg, FL. When Lue Annie’s father, John Boyett, died in 1938, his estate was divided among his nine children. His only daughter, Lue Annie Boyett Calhoun, inherited just over 100 acres of the family farm. Lue Annie and her husband moved from Florida back to the farm near Ray City, GA.
For the next 3o years, Lue Annie and Joe raised their children and crops on the Calhoun farm. They were well known citizens of the Ray City and Lakeland area. They were members of the Ray City Baptist Church and the Lakeland Parent-Teacher Association. Joe was a member of Masonic Lodge #434, and a member of the committee that oversaw the construction of a new Lodge Hall at Lakeland, GA in the 1940s. Joseph Burton Calhoun died in 1972 and was buried at Beaver Dam Cemetery in Ray City. For fifteen more years Lue Annie continued to live on the Calhoun Farm, but 1987 she returned to Florida to live out her final years. She died in 1993 in Winter Garden, FL. She was laid to rest at Beaver Dam Cemetery next to her husband. 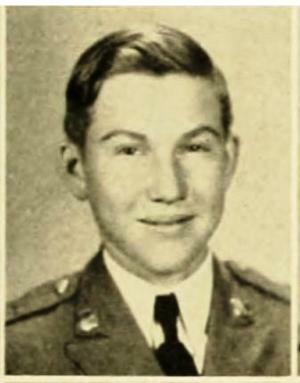 Edward John Boyett was a brother of William Jackson Boyett. John Boyett’s parents were among the pioneer settlers of Berrien County. His father, William Hill Boyett, came to then Lowndes County area from North Carolina as a boy , about 1853, and later acquired land near present day Ray City, GA. John Boyett’s mother, Jemima Taylor, was born January 22, 1842 in South Carolina, and came to Georgia with her family in the early 1850s. His parents were married on Christmas Day, Dec 25, 1856 in Berrien County, GA exactly ten months after the county was formed. Edward John Boyette and Mary Jane Sirmans, circa 1900. Image courtesy of I. Mitchell Calhoun. John Boyett grew up on his father’s farm in the 1300 Georgia Militia District, near Ray City. 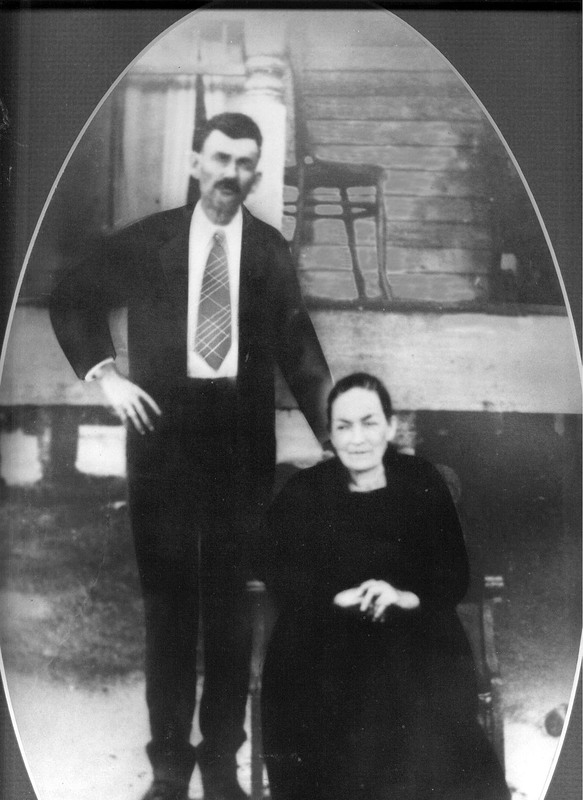 On January 15, 1891 John Boyett married Mary Jane Sirmans in Berrien County, Georgia. 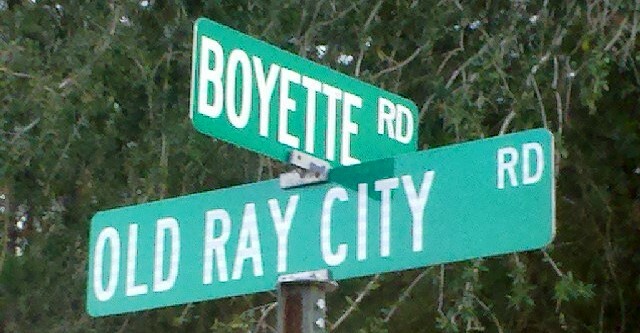 Boyette Road near Ray City, GA.
John Boyett died in 1938 and his estate was divided among his nine children. 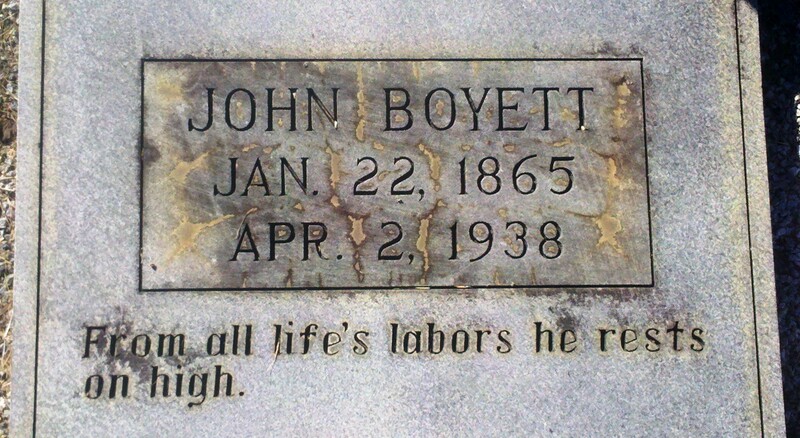 Gravemarker of John Boyett, Beaver Dam Cemetery, Ray City, GA.
Joseph Burton Calhoun, 1918, in WWI army uniform, probably taken in Atlanta, GA. Image courtesy of I. Mitchell Calhoun. 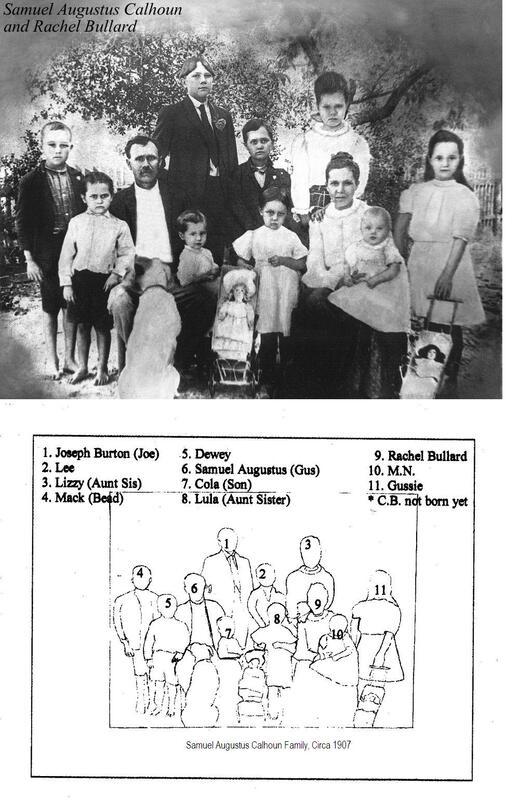 Joseph Burton Calhoun was a son of Samuel Augustus “Gus” Calhoun and Rachel B. Bullard, born December 10, 1892 and raised in Rays Mill, GA (now Ray City). In WWI he served in the U.S. Army. 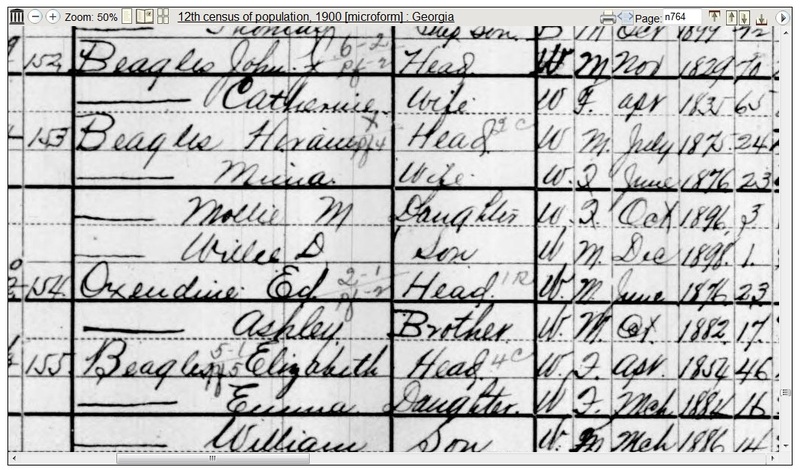 Prior to WWI Joseph Burton Calhoun had been living in Moultrie, GA where in 1917, he was employed by J.M. Bryan as a mechanic. On June 5, 1917 he registered for the draft for WWI in Colquitt County. His draft card gave his physical description as medium in height and build, with light hair and blue eyes. Nine months later, Joseph Burton Calhoun was back in Berrien County, GA where he married Louannie Boyette on March 4, 1918. Joseph Burton Calhoun was inducted into the Army on December 18, 1917 in Moultrie, GA. 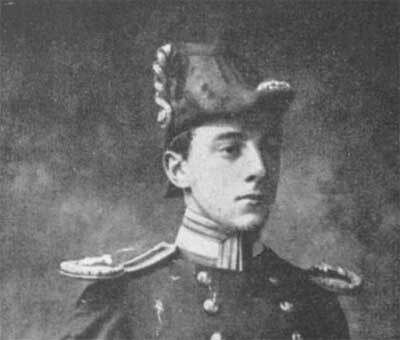 He was photographed in uniform along with a fellow soldier, in what appears to be a souvenir post card print. 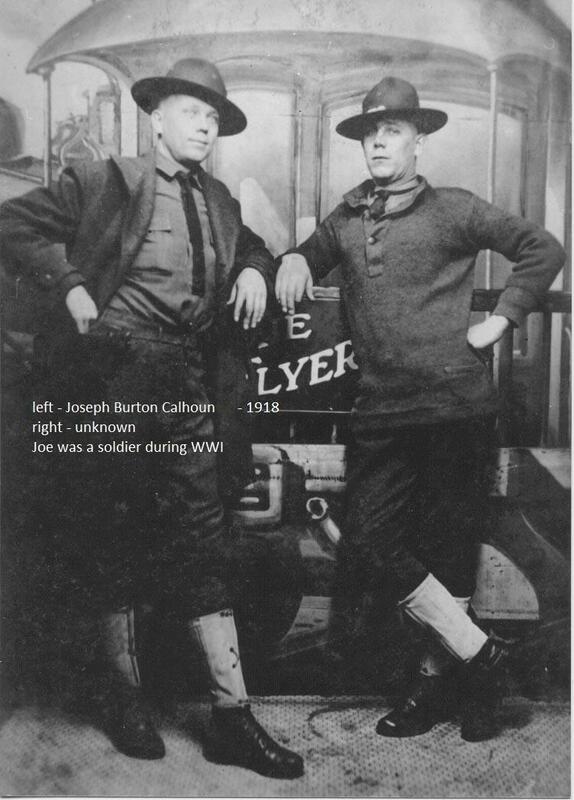 After training with the Machine Gun company of the 328th Infantry, Joseph Burton Calhoun served in the Military Police. Throughout WWI he was stationed with the Provost Guard Company at Camp Gordon, GA. Calhoun apparently obtained a WWI souvenir from a returning soldier who had served overseas. A family heirloom is a bolt action .41 caliber Swiss rifle brought back from the war. 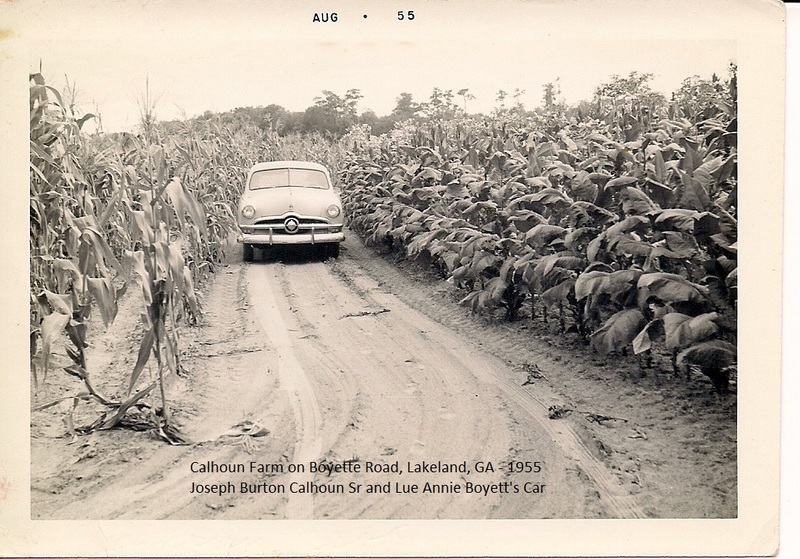 After the war Joseph Burton Calhoun returned to his wife and family in Ray City, GA.
Ray City farmer Samuel Augustus “Gus” Calhoun, subject of previous post (Gus Calhoun, Ray City Farmer), was from boyhood a lifelong resident of the Ray City area. He was born May 25, 1868, a son of Elizabeth Bell and Joseph Calhoun. 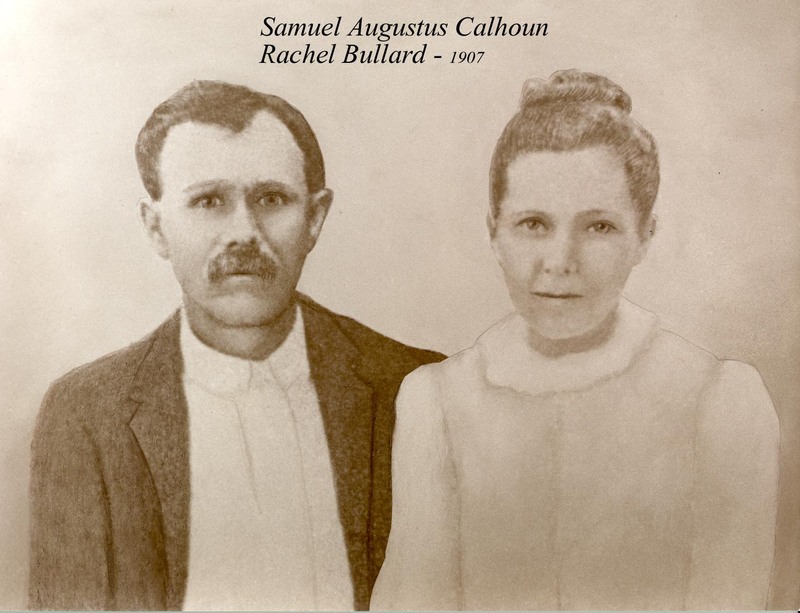 Samuel Augustus Calhoun and Rachel Bullard, circa 1907. Image courtesy of Irvin Mitchell Calhoun. By 1910 Gus Calhoun had moved his wife and children a few miles north to Ray’s Mill (nka Ray City), Berrien County, GA where he rented a farm next to his father-in-law, Mack Bullard. 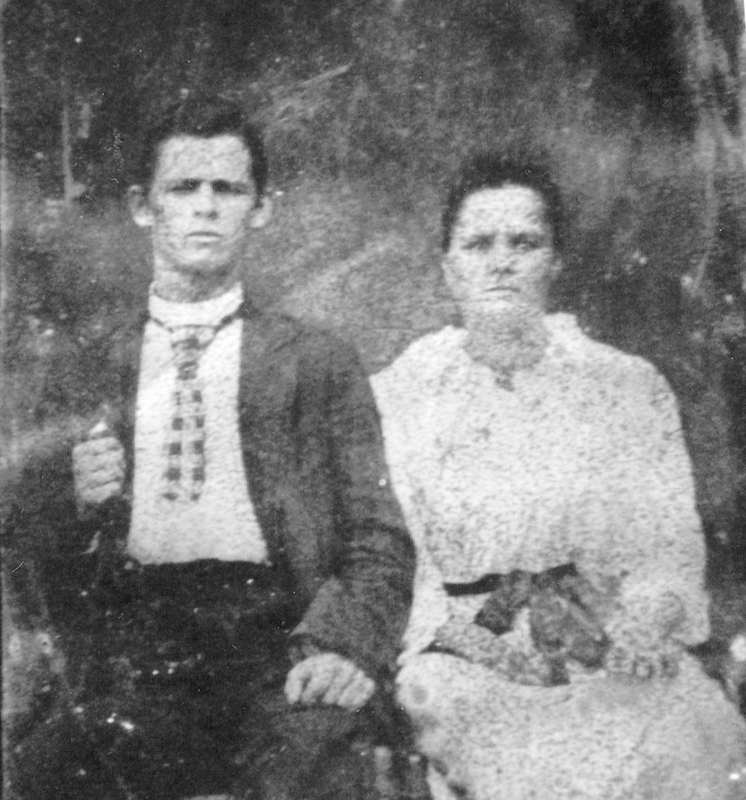 Rachel Bullard and Samuel Augustus Calhoun family, circa 1907. 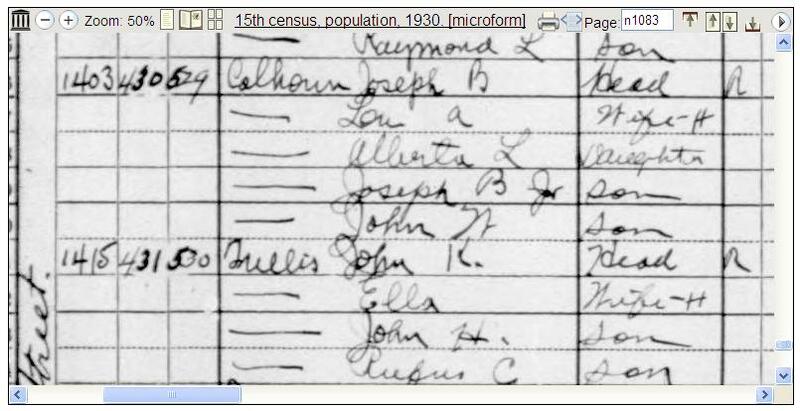 The 1910 census records show the Calhouns living at Ray City, Berrien County, GA during this time. The original photo was discovered in the attic of James Dewey Calhoun, Sr. and Mary Elizabeth Brogdon. About 1996, Irvin Mitchell Calhoun, great grandson of Samuel Augustus Calhoun had the photo professionally restored. Rachel Bullard Calhoun died in 1935 and was buried at Beaver Dam Cemetery, Ray City, GA. Shortly thereafter, Gus Calhoun retired from active farming and made his home near Ray City on the property of his son, Joseph Burton Calhoun. 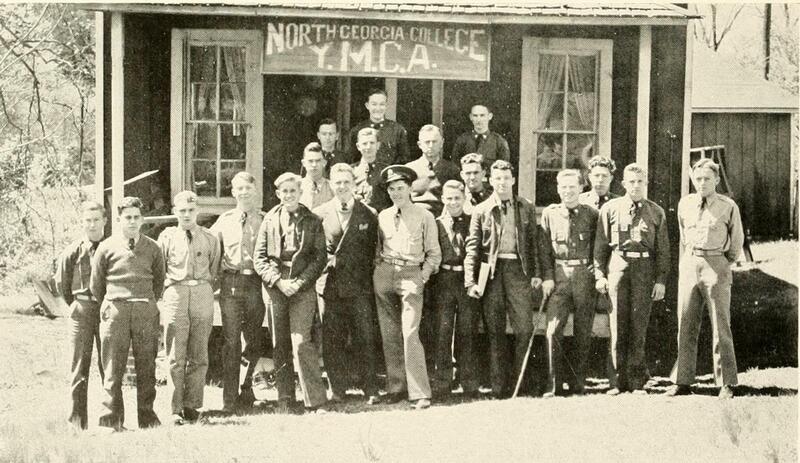 My grandfather (Joseph Burton Calhoun, Sr.) is the teenage boy standing up the center of the photo. .. I remember Grandpa Gus living with my grandparents (Joseph Burton Calhoun, Sr. & Lue Annie Boyett) on their farm on Boyett Road in the latter years of his life. I was born in 1941 so this must have been in the early to mid 1940s. They built a small one room shack out back of the house and he lived out there. We boys use to visit him often out there. He was always doing things with us. 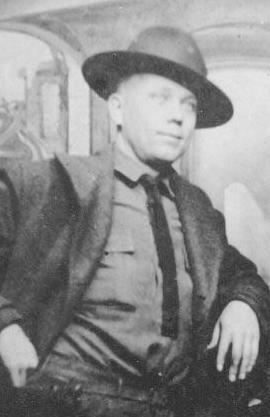 Samuel Augustus “Gus” Calhoun died January 5, 1957. The funeral services were held at Ray City Baptist Church and was buried at Beaver Dam Cemetery. Obituary of Samuel Augustus Calhoun (1868-1957) of Berrien County, GA. Image courtesy of I. Mitchell Calhoun. S.A. (Gus) Calhoun, 89, died Sunday afternoon at the home of his grandson, J.S. Gaskins, in the Allenville community of Berrien County after being in declining health for several weeks. He was a native of North Carolina, but came to South Georgia as a boy and lived here all of his life. Until his retirement some 20 years ago, he farmed in this area. He was a member at the Ray City Baptist Church. Survivors include three daughters, Mrs. Lizzie Brantley of Nashville, Mrs. Gussie Clark of Eloise, Fla. and Mrs. Lula Gaskins of Nashville; six sons C. B. Calhoun of Jacksonville, Fla. J. 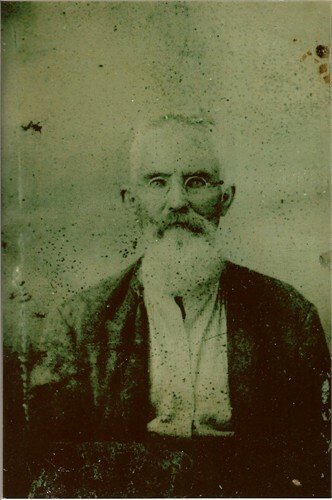 B. Calhoun of Lakeland, J. D. Calhoun and Mack Calhoun, both of Nashville, M. N. Calhoun of Winterhaven, Fla., and R. L. Calhoun of Jacksonville; 32 grand children; 50 great-grandchildren; and a number of nieces and nephews. Funeral services were held Tuesday afternoon at 3:00 at the Ray City Baptist Church with Rev. G. C. Tuten officiating. 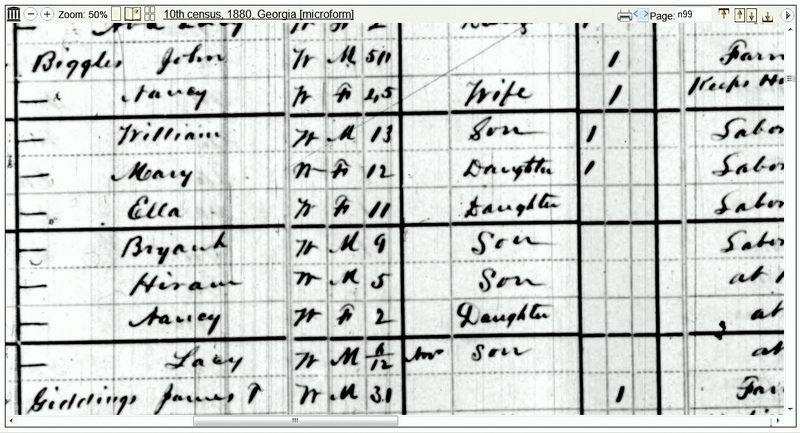 Special thanks to I. Mitch Calhoun for his research on Calhoun Family history , and for contributing images and content to this post.